What is the origin of our center? The current L’Olivera chiropractic center is the continuity of the center that Loik de Tienda opened in 1995 in the Plaza Gal·la Placidia (Gracia), which was relocated in Paseo San Antonio (Sants) in 1999 and then in Calle Taquígraf Martí (Les Corts) in 2015. 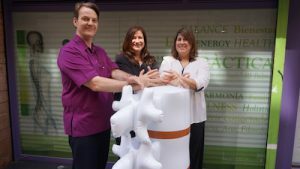 Roser and Loik de Tienda are the founding chiropractors of the current consultation, and they have Bianca Cáceres, another licensed chiropractor. We recently told the story in a video: LOOK! And our adorable team? Here you have them: Chiropractors and Assistants. And where are the center?